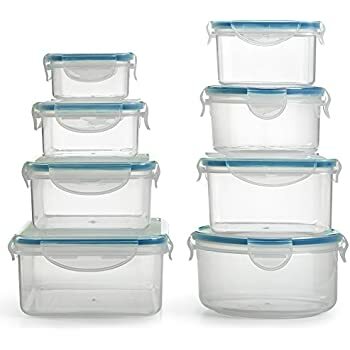 Amazon's Choice for "tupper ware"
5% extra savings coupon applied to first order only. 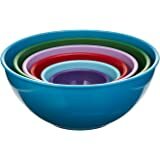 Sold by Fullstar Houseware and Fulfilled by Amazon. Gift-wrap available. 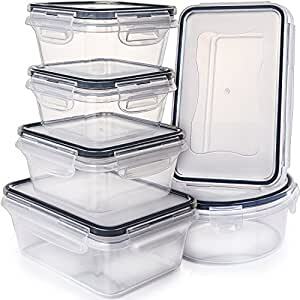 ✅ 12 PIECE SET includes 6 containers with 6 lids. 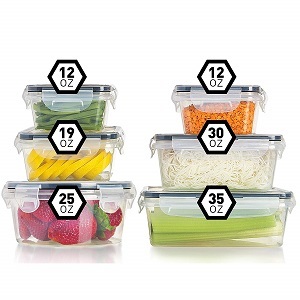 Store and transport entrees and soups confidently with our revolutionary snap-lock containers. Also great for small arts and crafts supplies like beads. 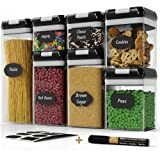 ✅ 5 SIZES fulfill all your storage needs. 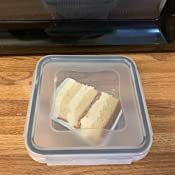 Includes (1) 35oz rectangular container [4.4 cups]; (1) 30oz rectangular container [3.8 cups]; (1)25oz round container [3.1 cups]; (1)19oz rectangular container [2.4 cups]; and (2) 12oz rectangular containers [1.5 cups]. 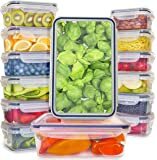 ✅ FDA APPROVED polypropylene plastic contains no BPA, phthalates or other toxins to leach into food. 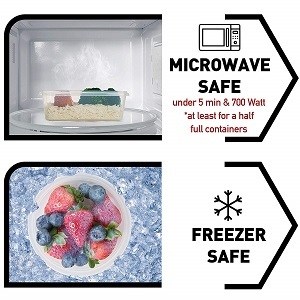 Fullstar Containers are refrigerator, freezer, microwave safe (base only, NOT lid, under 5 min, under 700 Watt, *at least half-full container). SPACE-SAVING utilization of freezer and cupboard area. 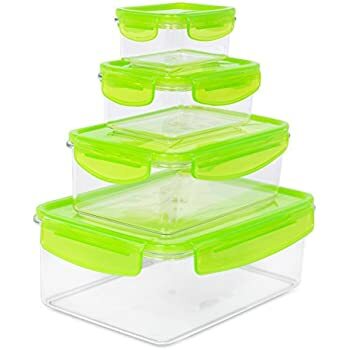 Fullstar Food Storage Containers make efficient use of every inch of your home kitchen because they are stackable and nesting. Sold by Fullstar Houseware and ships from Amazon Fulfillment. Your focus is on getting the most bang for your buck. 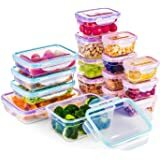 Fullstar Food Containers help stretch your dollars further by packaging leftovers in sturdy, reusable containers that stack neatly in your freezer and lunch bag. With our innovative 4-hinge snap-lock system, you can confidently send last night's lasagna to work or school, saving money on fast food trips and processed lunch kits. 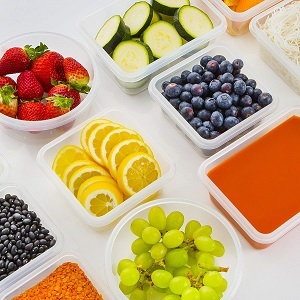 Fullstar Containers aren't just cost-conscious; they're healthier, too. Safe, durable and reliable Fullstar Food Containers are made in China from food-safe, FDA-approved polypropylene. 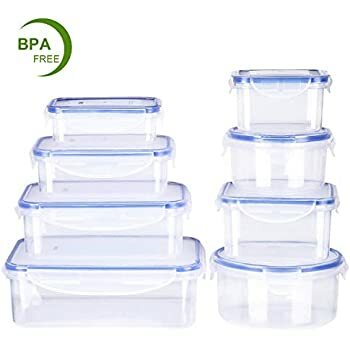 They can be placed in your refrigerator, freezer, microwave (base only, NOT lid) without concern about BPA or other toxins leaching into your food. They are also impact-resistant so they won't split or crack with the least little bump or drop. 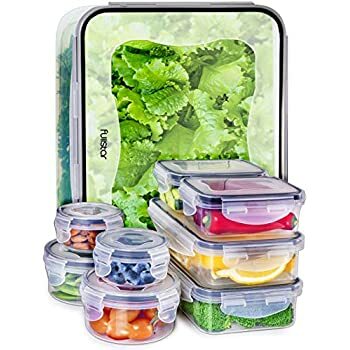 With their corresponding snap-lock lids, you won't be let down by a floor full of spaghetti or a lunch bag awash in soup. 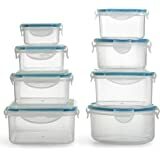 Fullstar Containers are suitable for organizing every room in your home. 5.0 out of 5 starsReally sturdy and they don't leak! 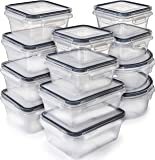 Every year, around black friday, I buy new sets of food strage containers because they are cheap and they never last. I decied to invest in something more durable this year. I bought these and another brand. These have been working out the best for me. I use them in my lunch and my kid's lunches. 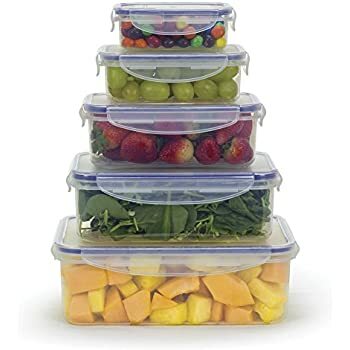 They are thicker then most containers and they don't leak at all. I like that the lids snap on too. Will buy more in the future. some of the products that have been sold have tendency of high rating, but always couple of extreme bad comments, which made me hesitate. However this one, not many reviews on it (fair amount) but all of them were really great. so I decided to buy this one. and to my surprise, they were way much better than I thought they would be!!!! 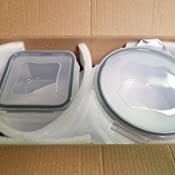 It would been nicer if it was glass ware simply for the sake of the health concern, but they were ok with microwave and dishwasher as written, and I am more than satisfied with the products and the service!!! So happy with these because there are more useable lunch sizes rather than a bunch of tiny ones. I’ll probably end up getting another set. I have had these for almost 2 months and still no staining. They are way thicker and much better quality than the rest of my sets. 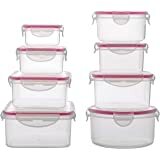 5.0 out of 5 starsThe PERFECT Storage Containers!!! Absolutely LOVE these containers! ... Sizes for all my needs, no leaking, airtight. ... My new favorite storage containers!!! They are so sturdy, easy to use and exactly what I was hoping for. The lids are super tight once snapped into place and just a great value for how well these are made! Will definitely purchase more when needed! 5.0 out of 5 starsLove ! Love all the different sizes. They easily snap closed with out leaking and can be tossed in the dish washer. I’ve had these for months and I use them all the time and they still look brand new !